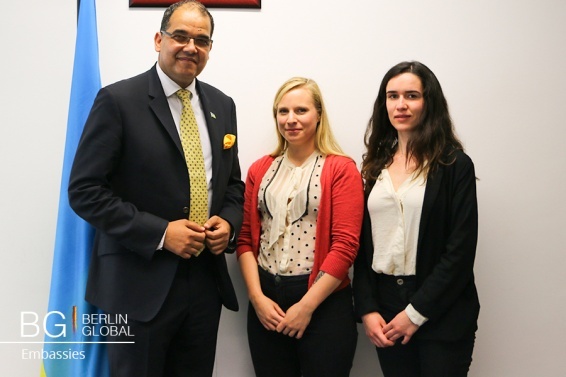 A team from the ICD had the pleasure and privilege to interview His Excellency Igor César, ambassador of Rwanda to the Federal Republic of Germany. This interview allowed us to gain a deeper insight into the nature and history of German – Rwandan relations as well as the His Excellency’s diplomatic work. We discussed how culture can stimulate people from different backgrounds to understand each other and work together. 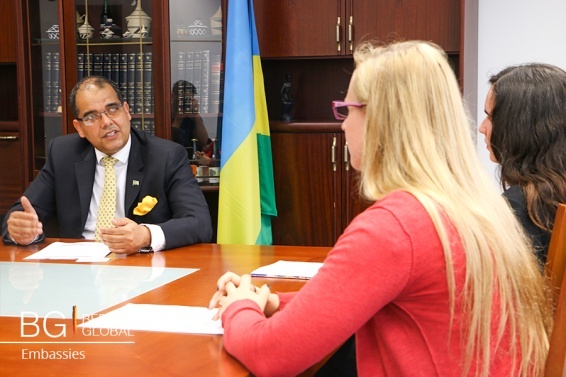 Furthermore, Ambassador César shared with us his vision of cultural diplomacy as deeply rooted in the Rwandan philosophy of Ubunu, based on the need for understanding and sharing with others. Unlike many other Ambassadors, H.E Cesar did not begin his career in diplomacy but in non-governmental organisations. As both a founder and leader of non-governmental community-based organisations in Rwanda, Germany and Canada, H.E shared with us how these experiences were beneficial to his current position. According to the Ambassador, working in an NGO trains one to motivate people to do something from their heart and to make different peoples’ interests converge in the aim of a common goal. This is an invaluable skill in the field of diplomacy. As in an NGO, working in an embassy also involves building bridges between cultures by collaborating on projects or developing partnerships in economy or education. Hailing from a multicultural background - the Ambassador is half German- half Rwandan – and having lived in Africa, Europe and North-America, his Excellency discussed the importance of being able to communicate cross-culturally with us, by understanding and correctly conveying the needs of one culture to another. We then continued on the subject of the nature of the historical relationship between Germany and Rwanda. Although diplomatic relations were established in 1963, the German – Rwanda relationship stretches back to the late nineteenth century, to the German colonial presence in the area. His Excellency told us that the relationship has always been characterized by mutual respect even through the upheavals of the mid-twentieth century. However, significant Rwandan – German cooperation began through the establishment of the Deutsche Welle station relay in 1963, which as a key vector of culture ‘’truly brought Germany to Rwanda.’’ This cooperation expanded to the technical and financial sectors in the late 1970s. In the 1980s, community and Länder-based cooperation began with the twinning of schools in Rhenanie-Palatinat and across Rwanda. Additionally, cooperation also occurs on an ‘’augenbeziehung’’ level, of which the establishment of the Deutsche Welle Film Akademie in Rwanda is an example. These forms of collaboration enable both countries to exchange expertise and foster intercultural understanding. Though cooperation between both countries is strong, Ambassador Cesar shared with us the possibilities for an even stronger relation between Germany and Rwanda. As one of the African continent’s fastest growing nations, Rwanda has been at the forefront of technological developments. For instance, the Ambassador was proud to tell us of how Rwanda has been using drones to deliver medication to healthcare centres across the country. According to H.E, the main challenge is to develop a more economical, sustainable development approach on the basis of partnership rather than on donor/aid basis. To this end, the Rwandan – German business day on September 14th, in Hamburg is a key development to ‘’change the image of a hopeless Africa to a hopeful Africa that Germany could learn from.’’ Tourism is also another sector in which the Ambassador considers that Rwandan – German cooperation could be strengthened. It is an extremely effective means of connecting people and converging their various interests. It not only encourages people to discover each other’s lifestyles, but it also stimulates the development of economic partnerships, projects and investment between a wide a variety of actors. It is precisely in this way, as stressed by H.E, that the African nations can be seen as thriving and appealing places to work and live. The Ambassador shared with us his own vision of Cultural Diplomacy and how it guides the Rwandan promotion of culture here in Berlin. For Ambassador Cesar, ‘’cultural diplomacy is the relationship between two countries, which is driven by people, who connect and spark in each other the desire to work together’’. Cultural diplomacy involves using culture as a connector, which is exemplified in the use of Gacaca in the wake of the Rwandan Genocide. Recounting the experience of Gacaca, the Ambassador recalled that ‘’to reconstruct the destroyed social fabric, it was necessary to reconnect Rwandans with their own culture and history in order to (re)unify.’’ The Ambassador particularly stressed the importance of Ubunu – in which the other is a pre-requisite for you to exist. In this sense, culture was instrumental in post-conflict reconciliation. To promote Rwandan culture in Germany, the Embassy mobilizes the Rwandan diaspora to be ‘’cultural diplomats’’ by supporting community-based events and exchanges and organising visits to the Rwandan Embassy here in Berlin. We also learnt that both Germans and Rwandans come to learn Kinyarwanda at the Embassy! By doing so, both young Rwandans and Germans can learn about each other and discover their commonalities. All these initiatives aim to connect Rwandans to each other – and to the rest of the world – truly embodying the spirit of Ubunu. In conclusion, H.E Cesar shared with us some valuable words of advice and encouragement. imparted upon some valuable advice. ‘’Be Involved! Be Relevant to yourself, to your community, to the country and to the continent, to the global context.’’ In a world where specificity makes global relevance less visible, H.E encouraged young aspiring diplomats to think beyond their context. In line with the philosophy of of Ubunu, the Ambassador stressed that ‘’thinking your relevancy beyond your surrounding’’ is what makes one truly human, by remembering to go beyond oneself and go towards the Other and try to understand them. Furthermore, when asked about advice on how to promote cultural diplomacy in our daily lives, the Ambassador recommended the importance of ‘’creating an environment, where from a young age, people are encouraged to get out of their comfort zones’’. Finally, ‘’adapting to different environments and people, to learn several languages and their cultures’’ is quintessential because ultimately, the active search for the Other is the key to knowing oneself.